During 2015-16, there were 633.88 lakh unincorporated non-agriculture MSMEs in the country engaged in different economic activities. Among which, 196.64 lakh in Manufacturing, 230.35 lakh in Trade and 206.84 lakh in Other Services and 0.03 lakh in Non-captive Electricity Generation and Transmission. (c) Construction activities falling under Section F of National Industrial Classification (NIC) 2008. 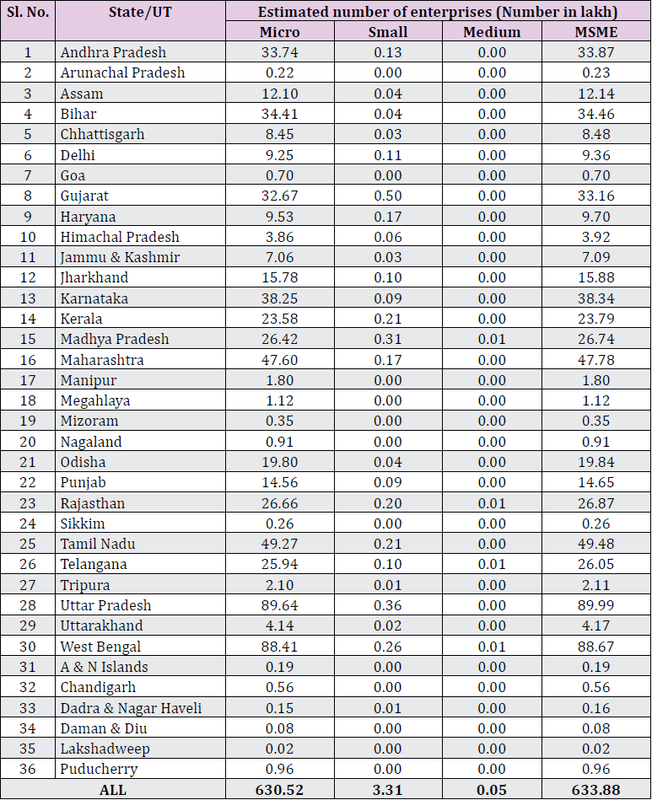 The above stats are taken from the findings/reports of the National Sample Survey (NSS) 73rd round, conducted by National Sample Survey Office, Ministry of Statistics & Programme Implementation during the period 2015-16 (July 2015 - June 2016) and some data are sourced from 2017-18 Annual Report of the Ministry of Micro, Small and Medium Enterprises, India.